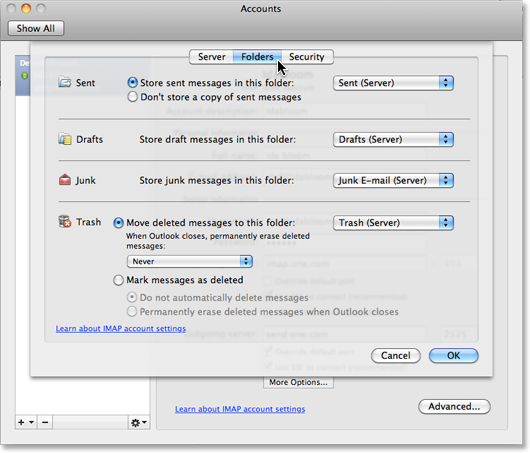 Make sure that you have the latest version of Outlook for Mac 2011. After launching Outlook, click on Help in the top menu, and then click on Check for Updates. The application will now tell you if there are any updates. Follow the instructions you get on the screen to install the updates. Click on Tools in the top menu and then click on Accounts. Click on the plus (+)-button located in the left corner, and then click on E-mail... in the drop down menu that appears. Enter the e-mail address you want to set up in the field E-mail address, and its password in the field Password. When you start typing the password, the rest of the window will expand, and more options will appear. E-mail address: Enter the e-mail address you want to add, in this example "name@example.com"
Password: The password is the same as you use when logging on the webmail for this e-mail account. Type 465 in the field for the outgoing server port, located to the right of the Outgoing server field. When you have entered all the information, click on Add Account. Enter a name in the Account description-field that describes your account. And then enter a name that will be shown as the sender in the field for Full name. Verify that the personal information and server information for your account is correct, and then click on the More Options...-button located in the bottom of the dialogue box. Next you will be asked to select an authentication method. 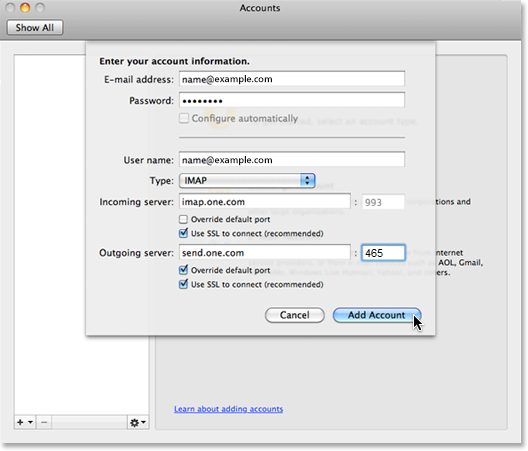 In the field Authentication, select User name and Password in the dropdown menu. In the field User Name enter the same e-mail address as earlier, and its password in the field Password. Leave the field for Unqualified domain empty. 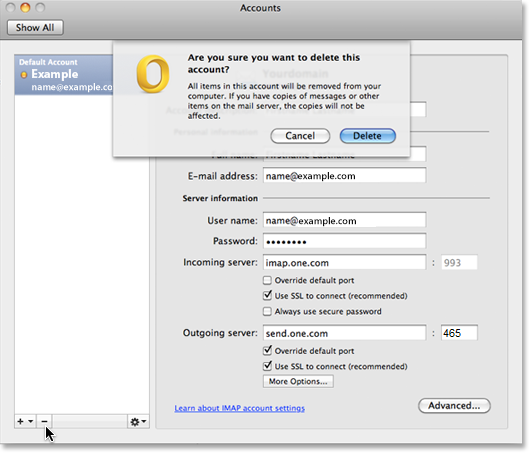 Congratulations, you have successfully set up your One.com mail account in Outlook 2011 for Mac, and the content of your account should be loading into the application. 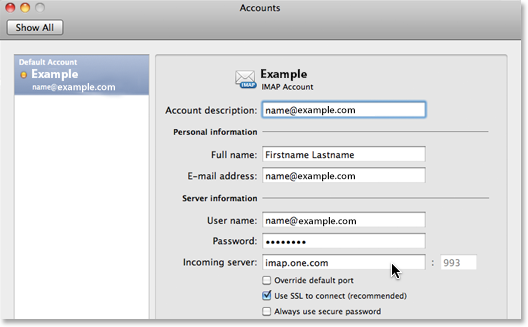 The next steps will show you how to sync your IMAP-folders. IMAP allows multiple clients to access the same mailbox, while keeping the e-mail messages available on the server for later access via webmail or other devices. 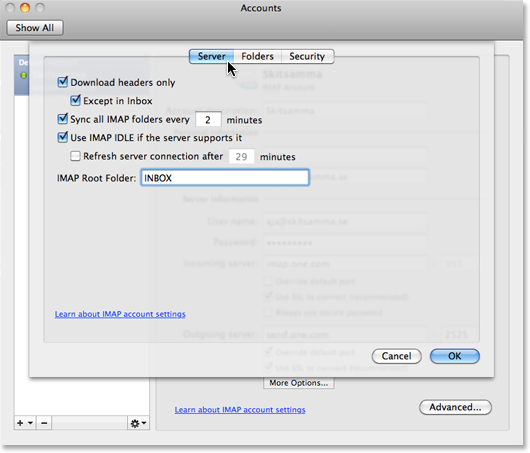 We recommend that you use these settings for handling IMAP folders from the start. First you need to make sure that you have the latest version of Microsoft Outlook 2011 for Mac installed. You can find more information about how to update in the first step in this guide. Click on the Advanced-button located in the lower right corner of the dialogue box. Click on the tab named Server. 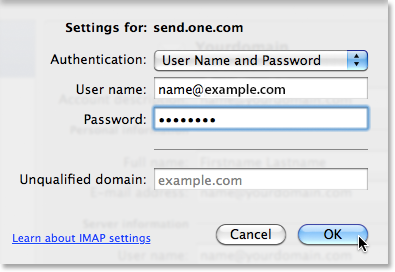 Enter the word INBOX written with uppercase letters, in the field IMAP Root Folder. Click on the tab named Folders. 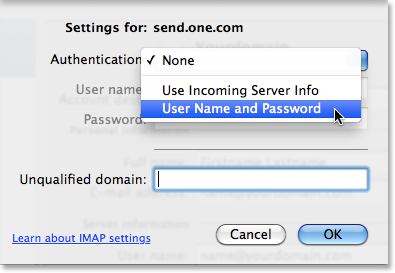 In the Sent section set Store sent messages in this folder: to Sent (Server) in the dropdown menu. In the Drafts section set Store draft messages in this folder: to Drafts (Server) in the dropdown menu. In the Junk section set Store junk messages in this folder: to Junk E-mail (Server) in the dropdown menu. In the Move section check the Move deleted messages to this folder: and select Trash (Server) in the dropdown menu. If you want to delete an account, click on Tools in the top menu and click on Accounts. Select the account you want to delete, by clicking on its name in the overview. 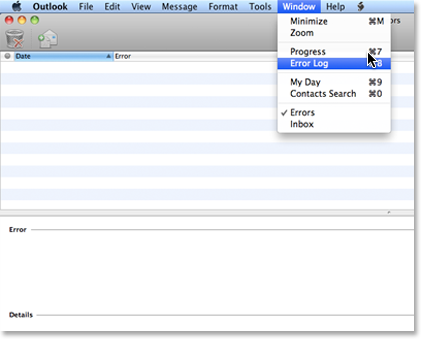 Then click the minus (-)-button in the lower left corner, and click on the Delete-button in the dialogue box to confirm. 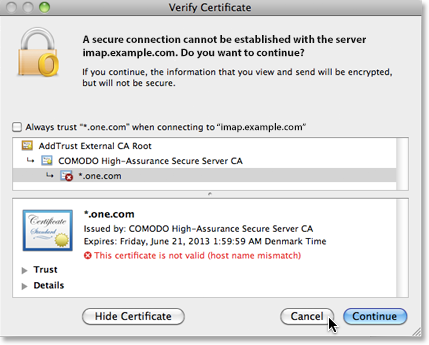 If you are trying to write an e-mail, and get an error message telling you that A secure connection cannot be established with the server imap.example.com, you should click on Cancel. You can solve the problem by clicking on Tools in the top menu and then click on Accounts. 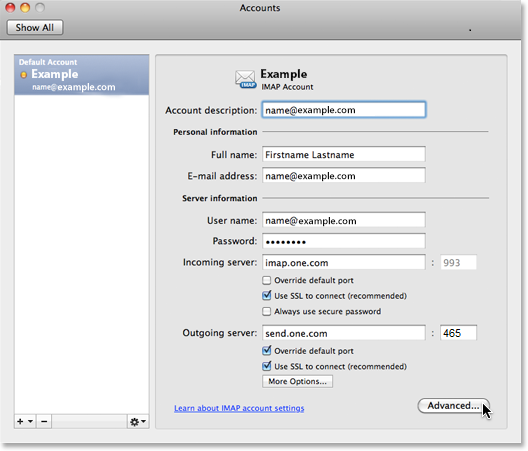 In the window that appears, select your account, and make sure that the Incoming server-field says imap.one.com (and not imap.example.com). If you experience problems with the setup of your account, it would help us if you make screen captures of your settings, and any error messages you might get, and send these to our support so they can help you find a solution. You can also check the error log within the application, by clicking on Window in the top menu and then click on Error Log. You will now get an overview of errors logged by the application. Information from the log can be useful when you contact us, if you experience any problems.